A polling place in Longmeadow, Massachusetts. There are important contested races in western Massachusetts. Here’s what you need to know as we head toward the general election on November 6. Question 1 would limit how many patients could be assigned to each nurse in Massachusetts hospitals and other facilities. A Yes vote would limit the number of patients a Massachusetts registered nurse could be assigned. A No vote would make no legal change related to patient-nurse limits. NEPR: On Question 1, What Can Massachusetts Learn From California? Question 2 would create a citizens' commission to consider and recommend potential amendments to the U.S. Constitution to reverse the 2010 Citizens United v. Federal Elections Committee decision. The reverse would introduce stricter regulations on campaign money flow, and establish that corporations do not have the same constitutional rights as human beings. A Yes vote would create a commission to advance the proposed amendment to alter corporations' constitutional rights and limit the influence of corporate money in politics. A No vote make no change, and not create a commission. Question 3 brings Chapter 134 of the Massachusetts Court's 2016 Acts into question. The act protects people in Massachusetts from discrimination based on gender identity in "places of public accomodation." A Yes vote would keep the existing legal protection from discrimination in effect. A No vote would repeal the protections. From left: Democratic Senator Elizabeth Warren, Republican candidate Geoff Diehl, and independent candidate Shiva Ayyadurai. Lt. Gov. 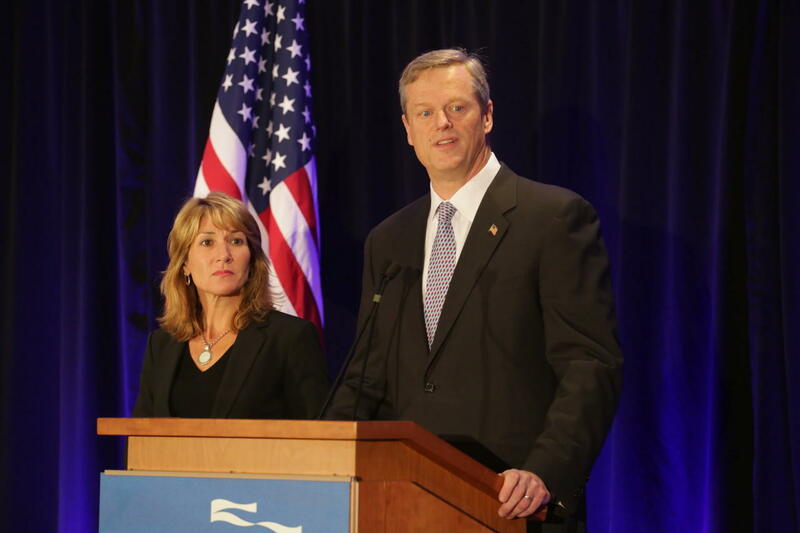 Karyn Polito and Gov. Charlie Baker. 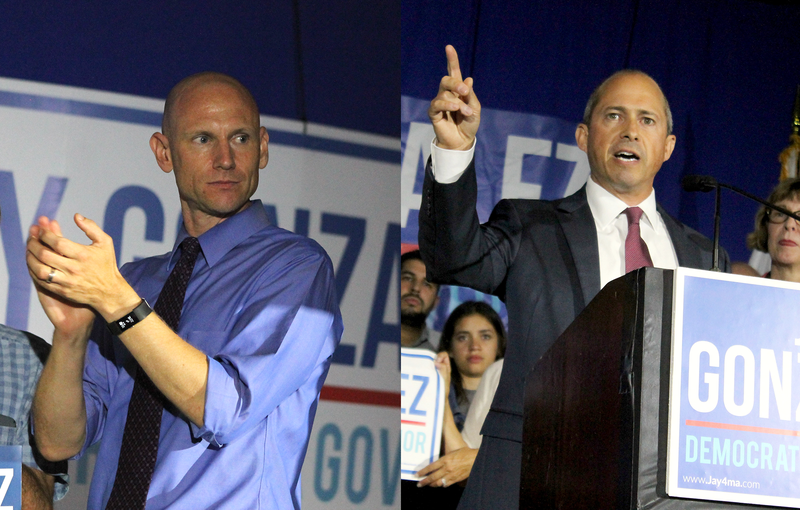 Quentin Palfrey at left, and Jay Gonzalez at right. 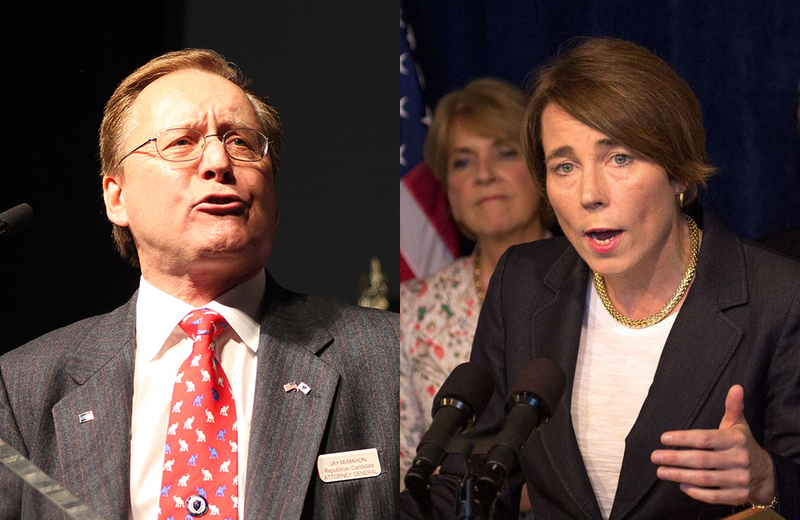 Jay McMahon at left, and Massachusetts Attorney General Maura Healey at right. From left, Jamie Guerin, Deborah Goldberg and Keiko Orral.